Terence Crawford - The best in boxing today? 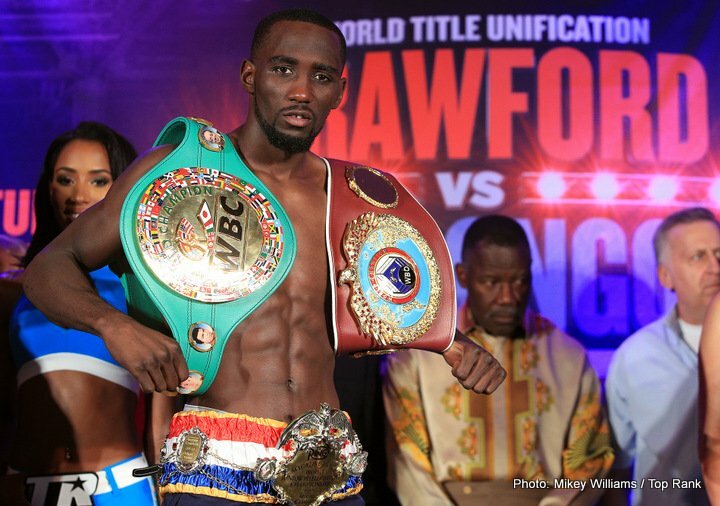 Terence Crawford – The best in boxing today? Written by DeMarkus Jones – There are a few names that you could justifiably as the best boxer in the sport today. Andre Ward, Vasyl Lomachenko, Mikey Garcia and Gennady Golovkin are some of the more popular names. However the guy that is most poised to take over boxing is Terence Crawford. He might not have the glamorous resume of Ward of the stunning highlight reel of Golovkin. However dive a little deeper and you will discover an elite boxer with no real visible weakness who is ready to be the top attraction in boxing. The first and maybe most understated fact about Terence Crawford is his entertainment value. He is not a huge persoanlity like Adrien Broner or Floyd Mayweather Jr. He is a reserved, well-spoken and intelligent young man. Neither is he a pure action fighter. Crawford is a methodical skilled tactician. While most pure boxers are labeled as boring fighters. The man known as “Bud” has never been in a boring fight. Mostly in part beacuse he fights to finish his opponent. With 23 stoppages in 32 fights he has an excellent k.o. ratio. However what seperates Crawford from other boxers is he actively looks to finish. While being a rangy, technical jab first boxer. Crawford looks to break his man down and end their night. Once he hurts his man he does not let them escape. As Max Kellerman pointed out during his knockout victory over the previously undefeated Yuriorkis Gamboa. “Crawford is a mean dude.” Not many boxers with Crawford skills also possess his mean streak and desire to sing his opponents home early. Terence Crawford has become that type of fighter, the type that when you watch them fight you are expecting a knockout. Another this that separates Crawford from his peers is he can do it all. He is the most well-rounded fighter in boxing today. At first glance Terence Crawford is your typical outside boxer. Good footwork, working behind the jab. However you also have to account for his switch-hitting. Crawford switches often in his fights. Fighting in whichever stance gave him the best advantage with little to no drop-off in effectiveness. I have personally never witnessed a boxer who switches stances as seamlessly and effectively as Crawford does. He looks equally comfortable on either side. Crawford has power and a good chin. He has been tagged a few times but never hurt. That’s when a boxer can land a good shot on him. Crawford also has spectacular defense. Crawford can lead or counter. He can fight inside or outside. He can even brawl when necessary. When I look at the current top pound-for-pound boxers in the sport I don’t see anyone with a skill set that can rival Terence Crawford. Crawford also seems to care about his legacy. He wants the big fights. He wants to make history. After his third round k.o. of Julius Indongo. Crawford became the undisputed Junior Welterweight Champion. The first undisputed champion of that weight class since Kostya Tszyu in 2004. Not only that Crawford is one of only four boxers to have in his possesion the WBC, WBA, WBO, IBF, The Ring and lineal titles. Joining Bernard Hopins, Jermain Taylor and Cecilia Braekus. In an era of boxing where almost everyone is just chasing big money fights. Everyone is jumping up and down weight classes to win multiple titles. It is refreshing to see a boxer who is willing to prove he’s the best at his weight class before moving up. Before moving up to Junior welterweight Terence Crawford was a unified champion at lightweight. Now they he’s the Undisputed Champion a junior welterweight there are plenty of big matches that await him at welterweight. So what do you get when you combine a young, hungry undefeated champion. A man who can just as easily boxes way to a 12-round decision but prefers to knock you out. A man who can knock you out with either hand and either stance. With a boxer who is determined to prove he is the best. You get Terence Crawford the best boxer in the sport today. I would love to hear what you guys think. So tell me in the comments if you think I’m right or who you think is the best boxer in boxing today. You are here: Home / Boxing News / Terence Crawford – The best in boxing today?